This post features some photos I just took of Victoria Beach in Laguna Beach, California, along with some tips for finding this quiet beach, among other things. One of the things that I’ve discovered the last few months is that California has some exceptional beaches, and I don’t mean the typical tourist hotspots where you’re likely to find hundreds or thousands of people on a large swath of sand in a public area. I mean the tucked away coves and bits of shoreline with amazing beauty, be it in terms of rocky coastline or other unique wrinkles that give them identifiable character. This is really a shame, because Main Beach Park is probably the most crowded and least intriguing of the beaches in Laguna Beach. Victoria Beach is one of the “South Laguna” beaches, located just north of Treasure Island and south of Keyhole Arch. It’s also north of the Montage Resort. You can see where it’s located on this map showing the various beaches in Laguna Beach. The above photo is one of the big reasons why Victoria Beach is one of my favorite beaches in Laguna. 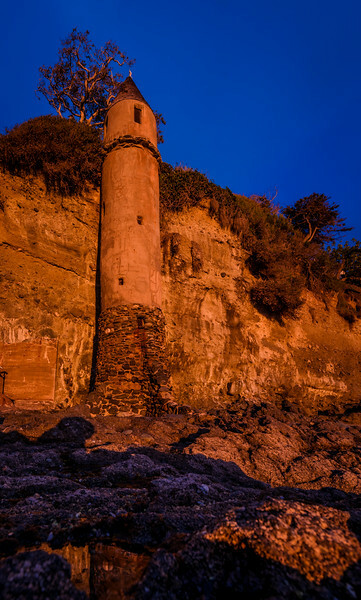 It’s known by locals simply as the “Pirate Tower,” and the name is somewhat apt in terms of the 60-foot tall tower’s appearance, as it certainly looks to me like something you’d see along the coast in Tortuga, a look-out tower for unfriendly vessels returning from pillaging the Spanish Main. 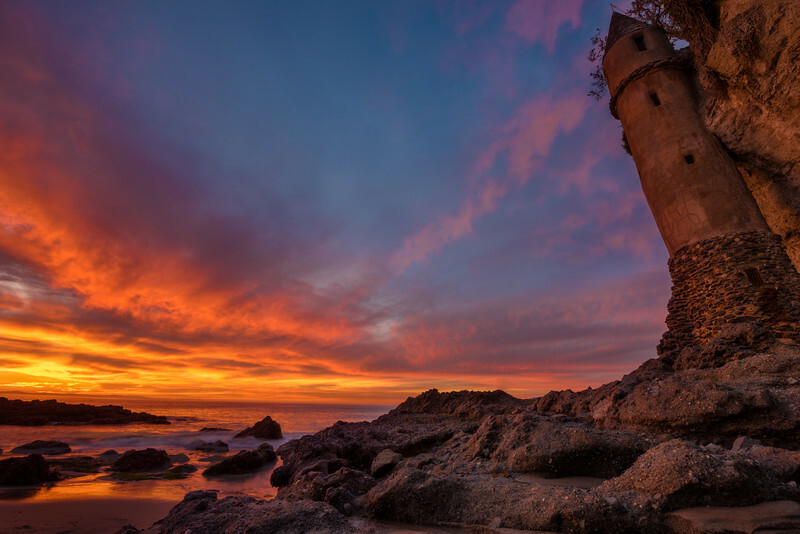 In reality, OC Weekly reports that the Pirate Tower was built in 1926 for the family of William E. Brown, a state senator representing California’s 37th district, and this ornate tower actually served as nothing more than a spiral staircase for Brown’s home to access the beach. So, why the “Pirate Tower” nickname? That story is much more interesting. As it turns out, Brown sold the house in the 1940s to Harold Kendrick, a retired naval officer. After he took ownership, Kendrick was known for dressing up as a pirate and hiding treasure all around the tower. It became a popular spot for local kids, who would search the area for Kendrick’s treasure, and were allowed to keep whatever they found. But Kendrick’s treasure was not what it seemed. Kendrick had somehow cursed certain medallions, and the local children who took these medallions would become undead skeleton pirates by night. These children still haunt the area by the light of every full moon. I might have made up the last part of the story, but how is the legend of this ever going to grow beyond “just stairs” and “local man dressed as pirate” to something greater without a little help? Regardless of the Pirate Tower’s history, this is a beautiful stretch of beach, featuring not just this, but some awesome rock cliffs, white sandy beaches, and a nice little reflecting pool that fills at high tide. Getting to Victoria Beach can be extremely difficult. From Pacific Coast Highway, it’s off of Victoria Dr. and only accessible via a narrow, unmarked set of stairs (public access to beaches is required, but I suspect the wealthy residents of Laguna Beach lobby to make that access as difficult to find and uninviting as possible) as the road winds around. You can see the stairs on Google Earth here. The best way to access Victoria Beach is to turn onto Nyes Place (on the other side of the PCH) and find some free parking up and around the hill. It’s about a 10 minute walk from there down to Victoria Beach, but you’re unlikely to find parking closer, and if you park in a NO PARKING residential area, you will be towed. Another way to access it that might prove easier is to head south to the street parking near the Montage Resort. If you walk behind the Montage, there’s a beautiful pathway with plenty of access to the beach. The problem with this route is that you won’t be able to get to a large portion of Victoria Beach at high tide, because the various coves along the way will be cut off. These photos were all taken by me with my Nikon D810 and Nikon 14-24mm f/2.8 Lens. I also used my MeFoto travel tripod. 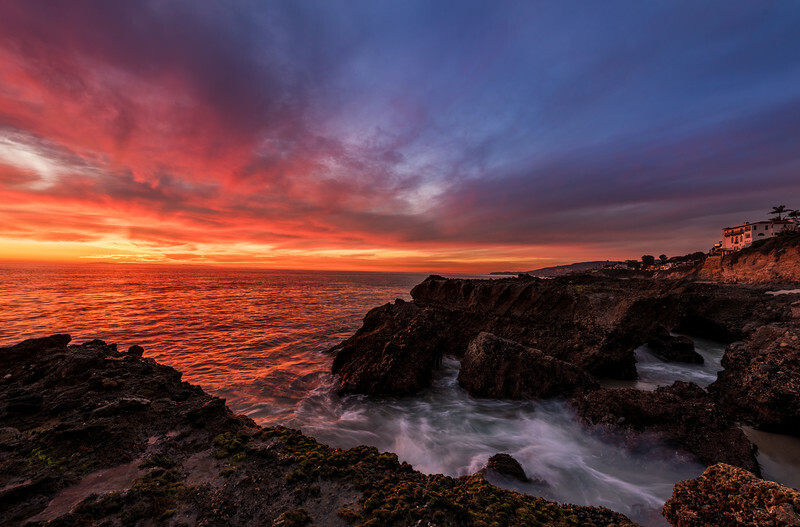 To get some more SoCal photo ideas, check out my Southern California Photo Gallery. Have you been to Victoria Beach? What do you think of it? Have another favorite secluded beach in Southern California? Interested in finding this pirate beach? Have any questions or other thoughts? Please share below in the comments! I finally made it to Victoria Beach yesterday. Thank you for posting instructions on how to find this! That stairway IS hard to find, and if I hadn’t read this, I wouldn’t have been able to get to the general right area. I parked on PCH yesterday just south of Nyes Place with no issue. There are parts that are free parking, north of the Montage. Once you get to the metered parts, then you’ve gone too far. I’ve driven by this area once before as well and seen spots available. So that might be a good tip to offer. It IS beautiful, and I definitely intend on going back! Yeah, the spots north of the Montage and south of metered parking directly on the PCH might be the safer bet. I just prefer parking on Nyes itself. Hope you got some good shots! They’re not as spectacular as yours, but I think I got some better than expected shots. =) Thanks again for the tips! Wow, these are stunning! What a sunset! But I definitely get why you recommended Victoria Beach. I’ve only been to Heisler Park and the beach below, which is nice, but this has some more unique features. I’ll have to stop by, hopefully on a dramatic sunset afternoon! Thanks for the info on access and stuff too! I would love to hear and see more from your California beaches reports. We are headed back this year and plan to try to possibly camp in Big Sur and I’ve always wanted to stop in Santa Barbara and need some ammo to talk my wife into it. We also plan to hit Lake Tahoe, Yosemite, and possibly Monterey for a night. Looking forward to seeing what else you have to offer us. Big Sur is definitely an upcoming topic, as I was there a couple weeks ago. I’ll try to get to other locations and cover those as well! As a resident of California, I vote for more coverage of the California beaches. So I know where else to go besides Disneyland when I drive/fly down. California has some amazing coastlines and the best places are the secluded spots away from the crowds because they are a little harder to get to. My favorite drive is the PCH between Morro Bay and Monterrey. Absolutely spectacular and something that most people not familiar from California have never heard of. YES! I’ll take that stretch a little farther, and say it’s stunning all the way up to Davenport (just north of Santa Cruz) and then after that, you’re pretty much into the Bay Area, which of course is gorgeous, as well. I can’t believe how fast you got this post up! I’m still uploading photos. Of course it took me about an hour and a half to get home with a couple of accidents to deal with on the Northbound 5 AND on the 55, but well worth sitting in that mess after that sunset. I love your colors. I’ll be happy if mine turn out half as good! If by half as good, you mean “twice as good” I think you’re about right. What a killer sunset, indeed. We drove past that going from LA to San Diego after dark. If I’d know there was a pirate tower would have made a point to stop anyway! 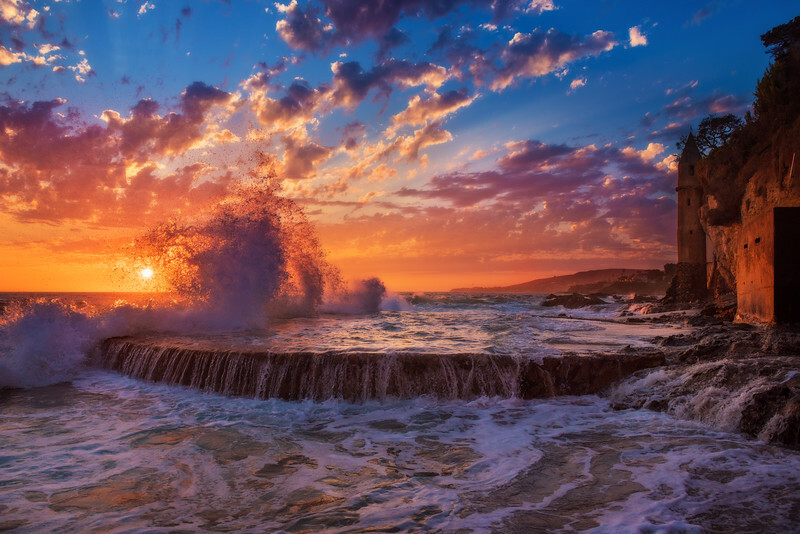 Did you see the tide pools in La Jolla? Those look gorgeous. Haven’t made it out there yet, but it’s on the list!